Setzer grew up in Long Island, New York. In his youth, he played the euphonium and other brass instruments in school jazz bands. In the 1970s, he found ways to hear jazz and big band music at the Village Vanguard, but he was also drawn to blues, rock, punk, and rockabilly. He admired the jump blues of Louis Prima and Big Joe Turner, but also the rock and roll of Elvis Presley, Eddie Cochran, Gene Vincent, and Carl Perkins. During the early 1980s, he led the rockabilly trio the Stray Cats and found popular and commercial success. After the band broke up, Setzer worked as a side man and on a solo career. In 1994, he released the debut album of the Brian Setzer Orchestra, which combined his rockabilly style with swing, big band, and jump blues. The orchestra had a hit on the Billboard singles chart with its cover version of "Jump, Jive an' Wail" by Louis Prima. The BSO often plays during the December holidays covering Christmas songs, and plays the Rockefeller Center tree-lighting ceremony. Setzer tunes have been used in commercials. ^ a b Erlewine, Stephen Thomas. 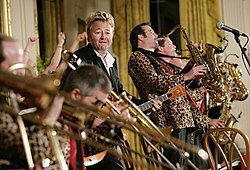 "The Brian Setzer Orchestra". AllMusic. Retrieved 3 February 2017. ^ DeRiso, Nick (August 2, 2015). "Brian Setzer Announces First Christmas Album in a Decade". Ultimate Classic Rock. Townsquare Media. Retrieved August 7, 2015. ^ "Discography". Brian Setzer. Retrieved 2012-04-24.